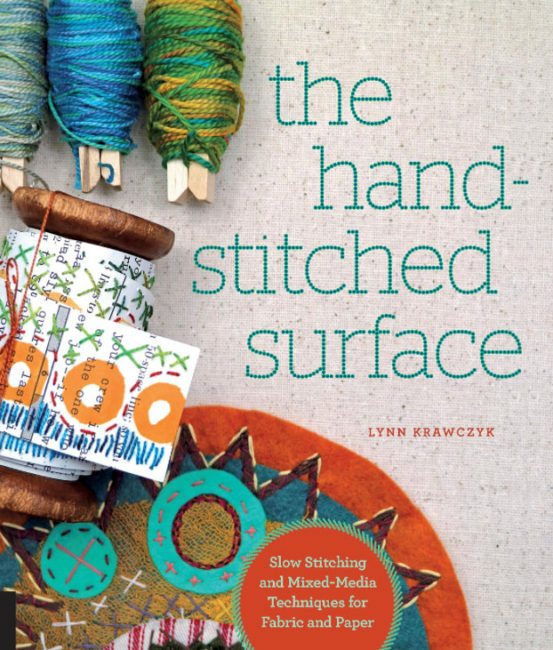 Lynn Krawkzyk’s new book The Hand Stitched Surface. Each illustrations is clear and beautifully rendered and Lynn’s examples are full of delightful whimsy. 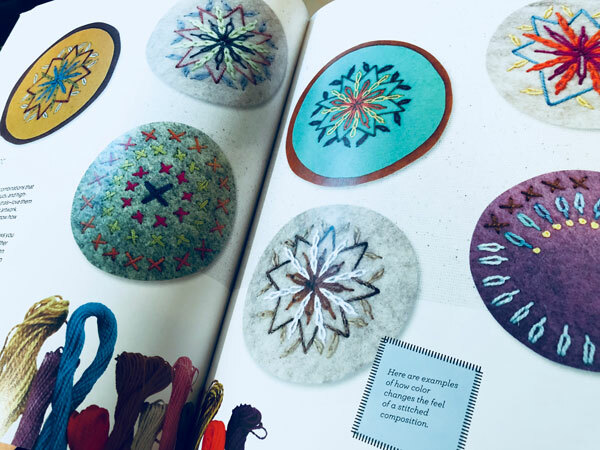 The projects are fabulous and include Stitched Buttons, Boho Collage Coasters, and a Technicolor Begonia Cushion among others. Reading this book and being inspired was the perfect reason to spend an afternoon with needle and embroidery thread. For me, there is nothing more playful and relaxing than choosing the perfect weight and color of thread to add little stitches to some small piece of textile work. That is it’s relaxing – until your fingers feel like they want to fall off as you struggle to pull the needle through several fused and quilted layers of cloth. Things can get a bit tough then. No worries. I’ve got a little tip that will make it MUCH easier to pull even thick pearl cottons through canvas! Take a peek and you’ll see what I’m talking about. It’s as simple as that. Use a rubber finger to pull the needle instead of pliers (been there – not fun) or a thimble. Rubber fingers are available at office supply stores. Pretty nifty, eh? And dear U.S. readers, you have a chance to win a copy of Lynn’s book by leaving a comment on this blog post! On On Tuesday July 17th I’ll choose a comment at random. I’ll post and contact the winner so keep an eye out. Be sure to stop by each blog on the hop and leave comments because every one of us gets to choose a lucky winner! I think this little guy is adorable. I’ll have to give your rubber finger tip a try. I love hand stitching and would love to have a copy of Lynn’s book. I love the rubber finger idea, it make s perfect sense!! Great photos, too! Nice tip using rubber fingers…will need to try for sure. I have followed Lynn for sometime and have been a fan of her fabric designs. This book is just what I’ve been looking for to continue explore hand stitching. Love being introduced to your work…exciting and inspiring. Thank you for the list of books. You certainly described my feelings with the fear to start because of the fear to fail. Looking forward to doing some reading. I just bought a box of rubber fingers from a thift store for my cats to pay with. they were completely uninterested – unlike their predecessors. I was about to put them in the give away box, when I saw this. I guess they are now going into my hand sewing basket. Hand stitching is my favorite way to work. I love the peaceful feeling I get when I hand stitch. I can’t wait to see this book. I follow Lynn’s blog and love it. Great rubber finger tip, won’t fall off like a thimble does. Thx. I will never stop learning, thanks to all you amazing stitchers! Fantastic tip…I have a rubber fingertip and use it often in my hand quilting. Am so enjoying the blog hop and hope to be a winner of Lynn’s fabulous hand-stitchery book. I tend to use a rubber finger as a thimble on my middle finger. I’ll have to try it as a needle puller on my index finger too. Thanks for the tip! Thanks for your beautiful post, and especially the tip about using a rubber finger. I will try it. I love your work, and Lynn’s too. Love your ideas and tips, Lyric. 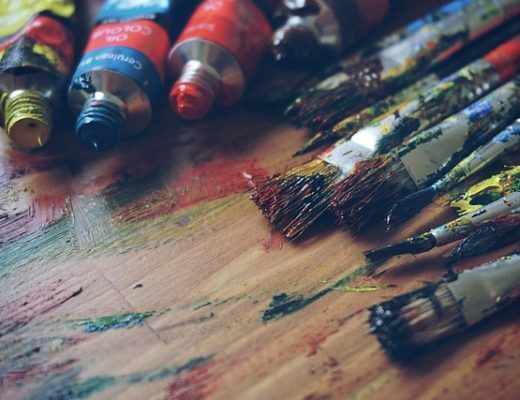 So glad that Lynn chose you as one of the artists on her blog hop. You guys are so inspiring. I love your winged man. Very cool. Thank you for the wonderful tips Tip! I have not seen these tips before so I will have to find them. I am enjoying this hop, finding new blog friends and inspiration along the way. Thanks! Great tip for difficult stitching! Thanks for the chance to win a copy of this wonderful book! Looks to be a lovely book. Thank you for the rubber finger tip. I enjoy doing hand stitching. I think its just so relaxing. Thanks for your tip on using a rubber finger. Never thought of doing that. Going to go out and get me some. What a unique project! Love your attitude about whatever can go through a needle is fair game. I always come away with something useful from you. Love handwork. Such a practical idea. Love to hand stitch on anything. This blog hop is inspiring me to hand stitch! Would love to win this book! I love when I learn that there are uses for ordinary things in extraordinary ways. And who doesn’t like shopping in an office supply store? Thanks — I’m sure this tip will be very useful. Thanks for the rubber finger tip. 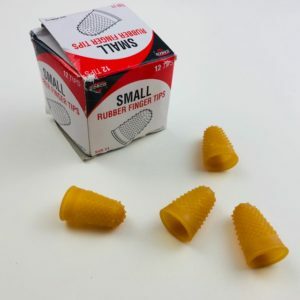 I’m looking forward to trying it out because thimbles just don’t work for me. Would love to win Lynn’s book! Thanks for the opportunity. that’s a great tip. cute little clown! I love the music with your video! The book sounds like fun too. I’ve used small squares cut from old bicycle inner tubes to pull needles through, the finger cots would surely be better. I could use a small project away from my machine, and it looks like this book has what I need. Great little tip that I’m guessing really saves the finger when stitching. Thx! Sometimes pulling that needle through can wear a hole on that finger. Lynn’s book looks wonderful, would love to add to my library. BTW, you clown piece is so fun! 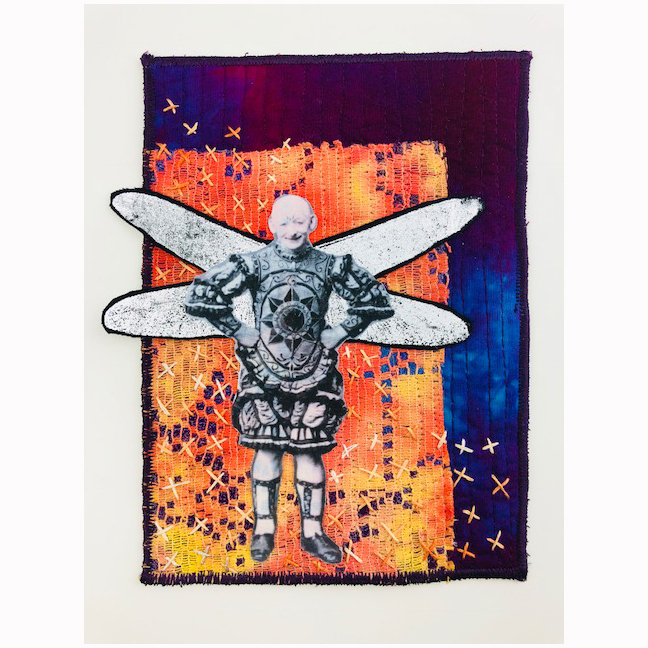 I love hand stitching – I want to incorporate it more into my works. Great tip! . . fingertip! Would love to read Lynn’s book. Great tip! 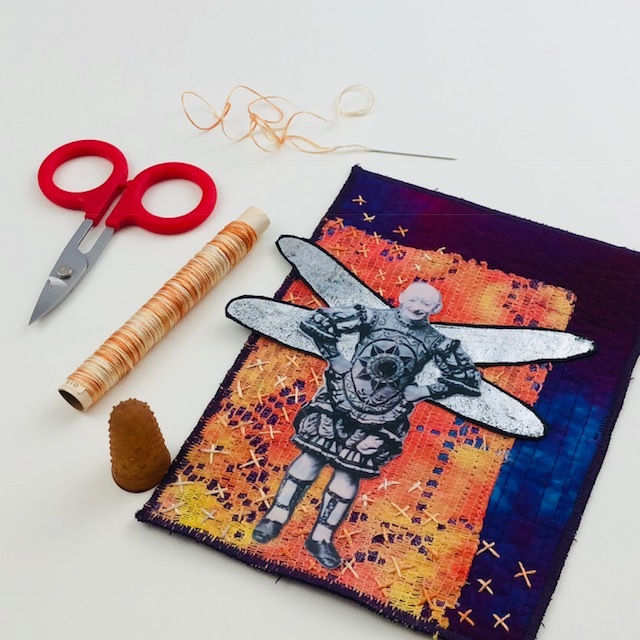 Dritz makes a version of these for quilters that come in different sizes. I have several and love them for this purpose. I can’t recall whether it was Lynn or Cheryl Slaboda who gave the info on the Dritz finger cots, but either type is a big improvement. I always forget about the finger cots until it’s late it night and my fingers are so very sore and the piece is ALMOST done………….and then when I’m in the office supply area I forget about the sore fingers! DUH! Thanks for the reminder! I have a stash of the rubber fingers from a crazy quilt class and always forget to grab one. Thanks for the reminder. I love the little man. He makes me happy and that is a good thing! Looking forward to this book. I’ve also used a deflated balloon to help pull a needle through. Great idea! I stay away from thicker threads because they were so hard to pull through, but will try the rubber finger. Thanks!! I have actually been using the “rubber finger” to help with my stitching, nice to see someone else does also. It really helps with my arthritic hand.